On March 5, 1770, English soldiers fired into a crowd of angry colonists, killing five. Two of the soldiers were later found guilty of manslaughter. The Boston Massacre, March 5, 1770, was an event that exemplified the growing tension between the American colonies and England which would subsequently result in the outbreak of the Revolutionary War. In 1767 the English Parliament had levied an import tax on tea, glass, paper, and lead. The duties were labeled the Townshend Acts—part of a series of unpopular taxes directed at the colonists without their representation. The colonists retaliated with attacks on English representatives and officials, and troops were dispatched to America to restore order. The agitation between the colonists and the English soldiers increased, reaching a climax on the evening of March 5. An apprentice antagonized an English soldier on guard duty and the soldier cuffed the boy on the ear with his firearm. The incident drew a gathering of hostile colonists, and the guard, alarmed at the size of the mob, called for help. The chief officer of the unit, Captain Thomas Preston, arrived with seven men. 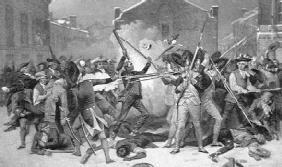 In an instant several shots were fired into the crowd of colonists: three men were killed at once; two more died later. The city of Boston braced itself for more violence; Lieutenant Governor Thomas Hutchinson calmed the crowd by promising the incarceration of the guilty soldiers to be followed by a trial for murder. Political leader Samuel Adams was influential in building a public case against the soldiers through his bombastic speeches and newspaper articles. He published a pamphlet that related the events of the violent evening as told by eyewitnesses; all the reports were decidedly in support of the colonists. The pamphlet, however, was not distributed in Boston, due to the belief that it might interfere with the fairness of the trial. The trial became a controversial issue with political aspects. In addition to the murder charge, the legal action intensified the struggle between the King's men, who desired a verdict in their favor to counteract the tactics of Samuel Adams, and the colonists, who wanted the trial to be an example to Parliament against further use of the militia to restrain their freedom. Lieutenant Governor Hutchinson believed that an immediate court hearing would be detrimental and unfair to the King's men; he advocated a series of postponements and the trial finally began in the fall of 1770. Robert Treat Paine served as prosecutor, and John Adams (cousin to Samuel Adams) and Josiah Quincy were the defense counselors. The trial progressed and arguments were presented for both sides. The defense was determined to prove that the soldiers were acting in Self-Defense. The prosecution attempted to show that the soldiers were guilty of malice with intent to kill. Captain Preston was tried separately (there is evidence that the jury was packed in his favor). He was acquitted and he hastily left Boston. Eight soldiers were next brought to trial and six were acquitted. The remaining two soldiers were found guilty of Manslaughter (as opposed to murder). The method of punishment was branding on the thumb. The two soldiers, Matthew Killroy and Hugh Montgomery, received their penalty and were discharged from the military. The irony of the Boston tragedy is that it need never have occurred. Shortly before the night of the bloodshed Parliament had decided to repeal the Townshend Acts that had so greatly agitated the colonists. Word of this decision did not reach Boston until later. The acts were revoked later in 1770, after the Boston Massacre; one tax remained, however, and that was a minimal tax on tea. This tea tax would later precipitate the Boston Tea Party.